Many of the thousands of spectators wept tears of emotion as the video wall ran the greatest moments of her career. A hero, a legend, a lady and an inaugural EHF Hall of Famer, after 31 years Natascha Keller (37 ) finally decided to put down her stick for good! Whilst her team Berlin HC could not produce quite the fairytale ending for ‘Taschi’, losing to Düsseldorf HC in the German Indoor Finals on Sunday, there was no doubt that it was a fitting occasion to honour one of the greatest athletes that the city of Berlin has ever produced. In her final game of the All Stars against the BHC ( Full Time 6: 1) she scored five goals. What a talent! One last time she ran on , through the cordon of team colleagues from the Berlin Gold team HC and the 2004 Olympics in Athens. Johannes B. Kerner and even Britta Becker ( 41) who retired shortly before Athens, dusted off her stick to play with her former teammate. Germany coach Jamilon Mülders is quoted as saying that Taschi would make a wonderful coach or manager, but she will find her place in hockey. 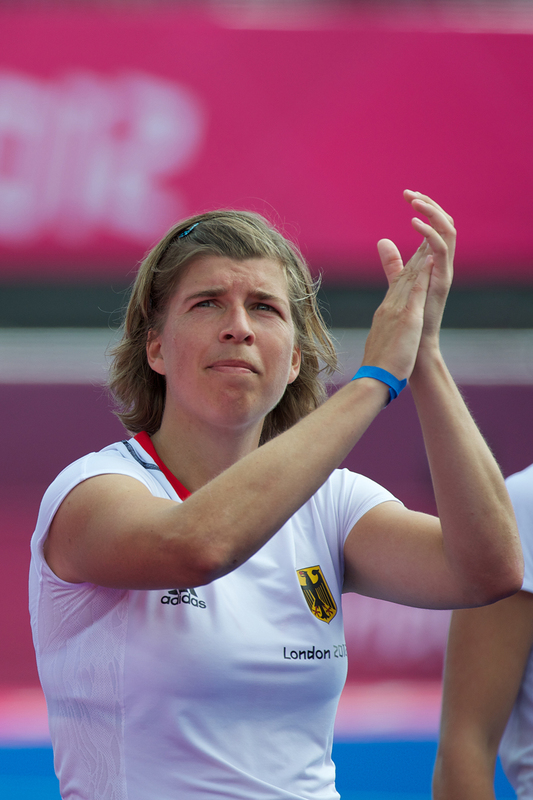 Whatever Natascha Keller decides to do within the hockey family, we know that everyone from every club and Nation in Europe joins us in wishing her well and we look forward to welcoming her as an EHF Hall of Famer to many halls, stands, stadia and sidelines in whatever role she decides to take on! There is no doubt that she will put the same dedication into that role as she did on the pitch! The hockey world is a better place with ‘Tashi’ in it. Thank you and Auf Wiedersehen…..
NextCan Europe take all the Indoor World Cup Medals again?